All wireless replacement cables are quality made and tested in the U.S.A. and feature a Limited Lifetime Warranty . 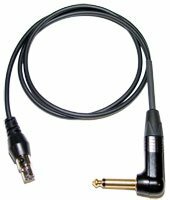 All cable with a 1/4" plugs have the option to upgrade to a Neutrik NP2C-AU-SILENT or NP2RX-AU-SILENT plug to eliminate "pops" & "squeals" when changing instruments. Please confirm wiring or manufacturer's part number with your owner's manual before ordering. Custom lengths & cable/connector deviations can be made upon request. *AKG, Audio Techinca, Brace Audio, Carvin, Electro-Voice/Telex, Line 6, Nady, Peavey, Samson, Sennheiser, Shure, X2, X-Wire are registered trademarks of their respective companies and have no affiliation with Best-Tronics Mfg., Inc.